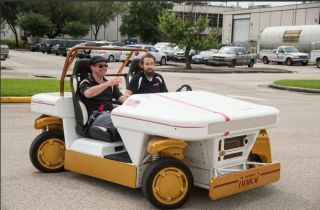 Author Andy Weir (left) takes a ride on NASA's Modular Robotic Vehicle at the Johnson Space Center in Houston during Mars Week in April 2015. It's no surprise that science fiction writer Andy Weir, author of the acclaimed novel "The Martian," stopped by NASA's Johnson Space Center in Houston recently. After all it was Mars Week at the space center and officials there rolled out the red carpet - and a rover - for Weir's visit. As you can see here, that's Weir on the left, taking a spin on a Modular Robotic Vehicle (MRV for short), a battery-operated rover that looks like it could be just at home roaming the desolate surface of Mars as it would traversing the back nine of a golf course on Earth. You can see a video of now the MRV works here. Weir climbed aboard the the MRV and took a tour of NASA's Johnson Space Center between last week between April 28 and April 30. According to the NASA video, the MRV has four independent wheel modules, can make a 360-degree turn in place and - because it's NASA ride - has redundant systems to ensure reliability. It doesn't even need a person behind the steering wheel to get around. A remote-steering system allows it to be commanded remotely for unmanned operations. In addition to checking out NASA's MRV, Weir also toured NASA's Mars habitat modules (perhaps comparing them to his Hermes habitat in "The Martian." He also spoke at a Mars Week event, during which he described his visit to JSC as a "nerd dream come true," according a JSC post on Twitter. "The Martian" (Broadway Books, 2014) hit store shelves last October and will make its way into movie theaters later this year, in November, with actor Matt Damon portaying Watney. I for one, can't wait to see Weir's vision of survival and strife on Mars realized on the big screen.